Arched openings over the garage doors and a metal accent roof are just two of the thoughtful exterior details that lend curb appeal to the Silvergate home plan. The details continue on the interior of the home plan. 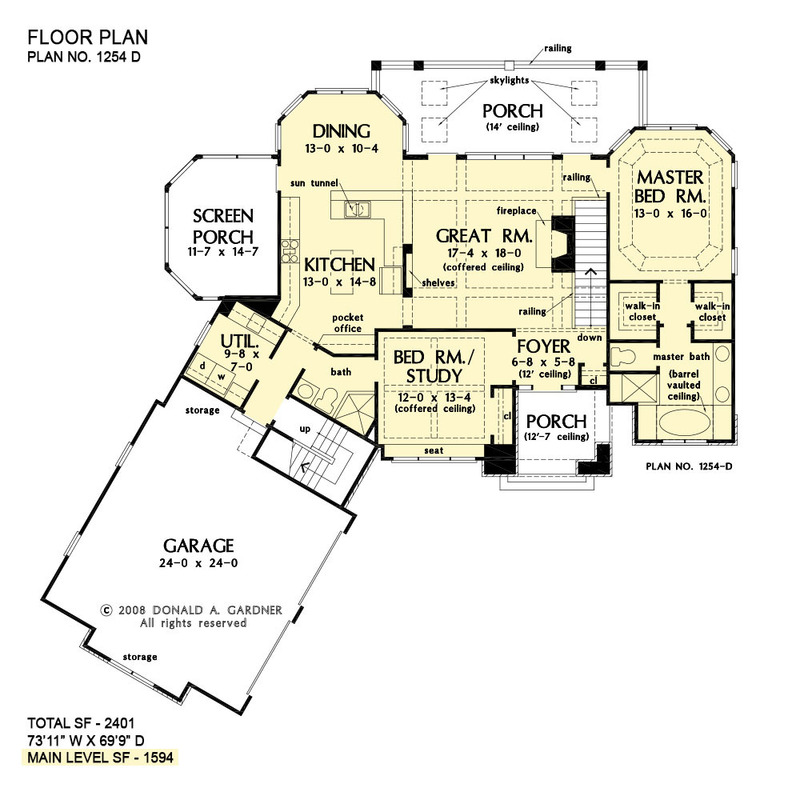 The main level includes a great room and bedroom/study with coffered ceiling details along with an open kitchen and dining room arrangement that simplifies entertaining. The master bedroom features twin walk-in closets and a bay window that easily accommodates a sitting area. Outdoor living space is abundant, with a screen porch off the dining room and an oversized, sky lit covered porch on the rear of this home plan. Downstairs is a cozy rec room and two more bedrooms, one with a private bath. The ample unfinished mechanical/storage area can easily be converted to a home theater, exercise area, or for any purpose you desire. 1st Floor: 1594 Sq. Ft. 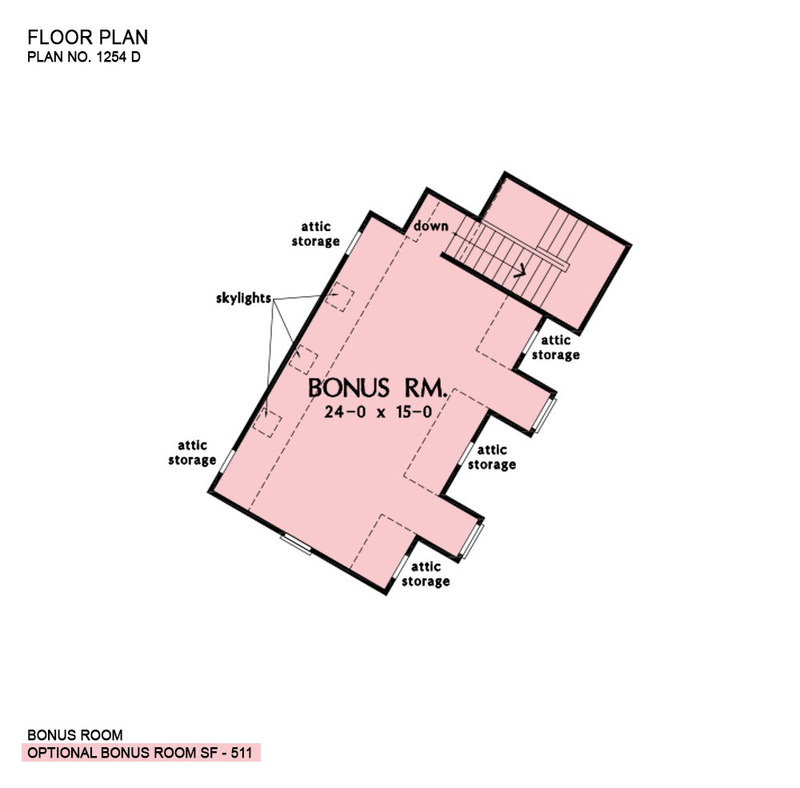 Bonus Room: 511 Sq. Ft. 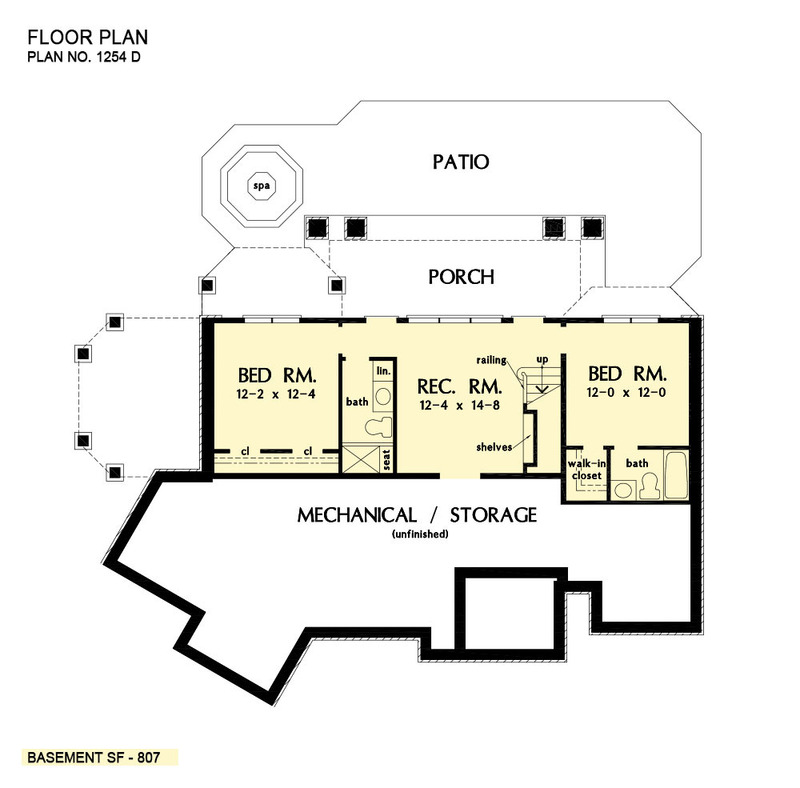 Unfinished Basement: 811 Sq. Ft.
Porch - Screened: 173 Sq. Ft.
Porch - Front: 98 Sq. Ft.
Porch - Rear: 265 Sq. Ft.
House Dimensions: 73' 11" x 69' 9"
Great Room: 17' 4" x 18' 0"
Bedroom #3 : 12' 2" x 12' 4" x 9' 7"
Bedroom #4 : 12' 0" x 12' 0" x 9' 7"
Bonus Room (Clipped): 24' 0" x 15' 0" x 8' 0"
Dining Room : 13' 0" x 10' 4" x 9' 0"
Pocket Office : 6' 1" x 2' 8" x 9' 0"
Foyer : 6' 8" x 5' 8" x 12' 0"
Garage Storage : 3' 8" x 10' 8" x 0' 0"
Garage Storage Bay : 2' 0" x 11' 4" x 0' 0"
Great Room (Coffered): 17' 4" x 18' 0" x 14' 0"
Kitchen : 13' 0" x 14' 8" x 9' 0"
Mechanical Room : 51' 6" x 13' 8" x 9' 7"
Patio - Lower : 11' 2" x 48' 8" x 0' 0"
Porch - Rear : 29' 4" x 10' 0" x 14' 0"
Porch - Front : 9' 8" x 9' 0" x 12' 7"
Porch - Screen : 11' 7" x 14' 7" x 9' 0"
Porch - Other #1 : 39' 4" x 10' 0" x 9' 10"
Rec Room : 12' 4" x 14' 8" x 9' 7"
Utility Room : 9' 8" x 7' 0" x 9' 0"